The Victoria Sampler Heirloom Wedding Sampler pamphlet includes three sizes of this design: Larger version (which I stitched on Platinum color 28 count cashel using white range of threads) has a design area: 302h x 72w. 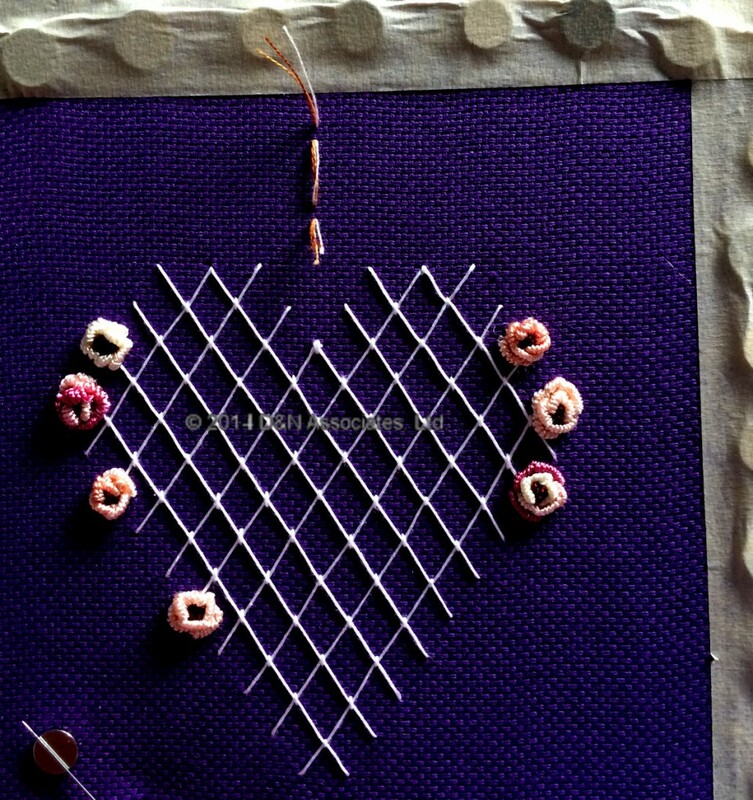 The floral heart part of the design that I am stitching here as a topper for a lidded box has a stitched area that is about 120 w by 120 h. I am working it on a 7 inch square of 22 count dark purple Hardanger fabric. 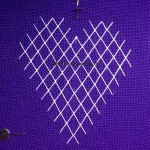 I used DMC Coton a Broder Size 20 thread in blanc for the diagonals of the heart’s trellis. 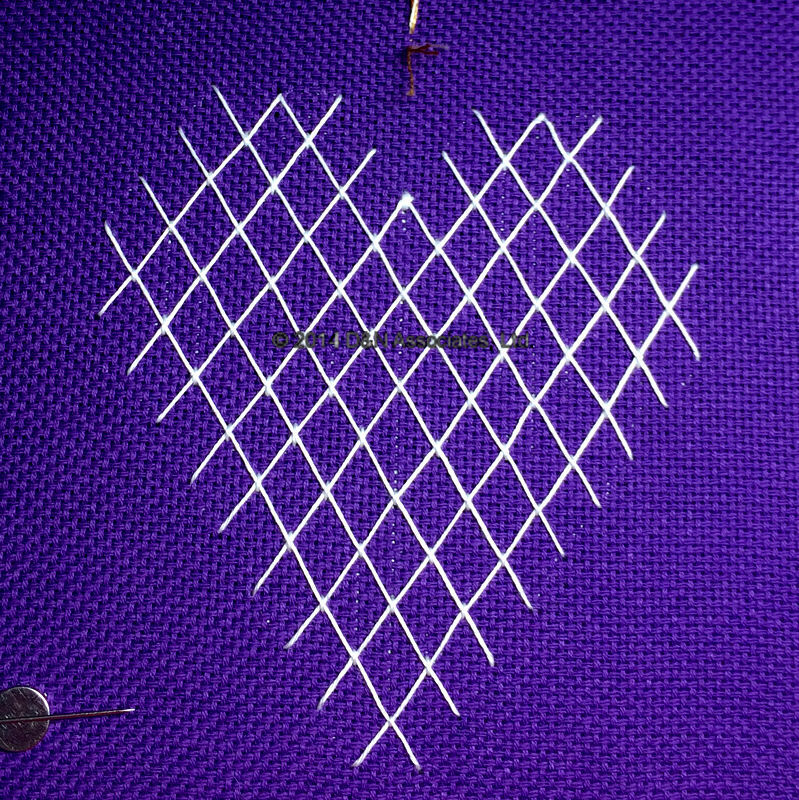 The 2.5 yard length of the thread for the heart’s diagonals was a bit of a knotting pain when I did my first stitching of this heart design as part of the Heirloom Wedding Sampler that I worked for my cyberclass. That first working of the diagonals for the heart design was done using DMC white perle size 8. In comparison to the perle size 8 that kept tangling on me I found using the Coton a Broder to be a lot more user friendly thread when using such a long length of thread. And this 22 count fabric came through in great shape though this final correctly spaced set of long diagonals stitches was my fourth attempt. The instructions for the cyberclass started with a long diagonal line and I kept being off by one or two fabric threads when I got to the last few diagonal lines. For my final attempt last eve to stitch the trellis I choose to start with that short center diagonal line that starts right on the middle line of the fabric and then (the diagonal line) ends lower left of the center fabric line. Thank goodness all those diagonals lines finally came out exactly where they needed to be with respect to spacing. About two months ago I started a web search for lidded boxes with the idea to finish the interior and exterior with fabric or a nice quality wrapping paper. 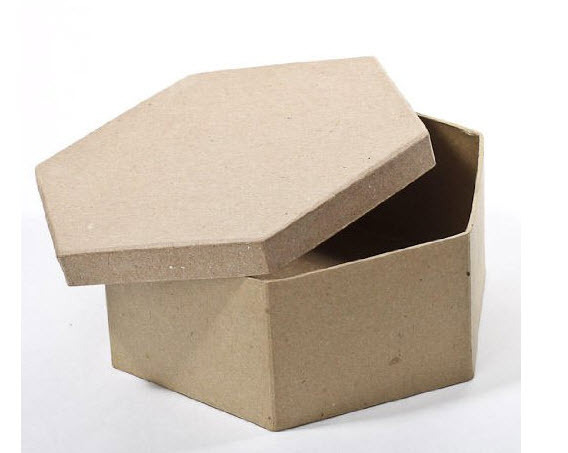 I found several shapes of paper mache boxes on Amazon, ordered a set of four hexagon shaped ones of the size 7 x 7 x 3 inches. Having never done this (finishing a paper mache box and gluing embroidery piece on top) I churned and churned for several hours over the last weeks reading articles and deciding how best to approach this finishing so that I didn’t end up with glue smugs on my worked piece. Last night, trying to fall asleep, I kept awaking myself wanting to come up with a quick way to add a nice finish to the box but not take a lot of time doing so as I am falling behind in keeping up with the six Victoria Sampler cyberclasses that I am taking. The light bulb in the brain went off when I recalled we had several decade old cans of spray paint in the garage. I found two cans of a light green enamel spray paint out in the garage this morning. Both are high gloss and that turned out great on the box. The box is now drying and I will probably let it dry indoors for a day or two (it is very humid in Northern Virginia today and for the next few days) before I attempt to glue the embroidery onto the lid. I think the hexagon shaped box will add some interest to the finished project. 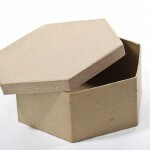 The high gloss light green spray paint looks good on this paper mache box. I had been concerned that the wet/sticky-ness of the paint would rise a nap out of the paper mache but it hasn’t. 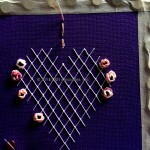 The instructions called to stitch seven pillow shaped satin stitches using white Trebizond silk thread for the center of the roses. 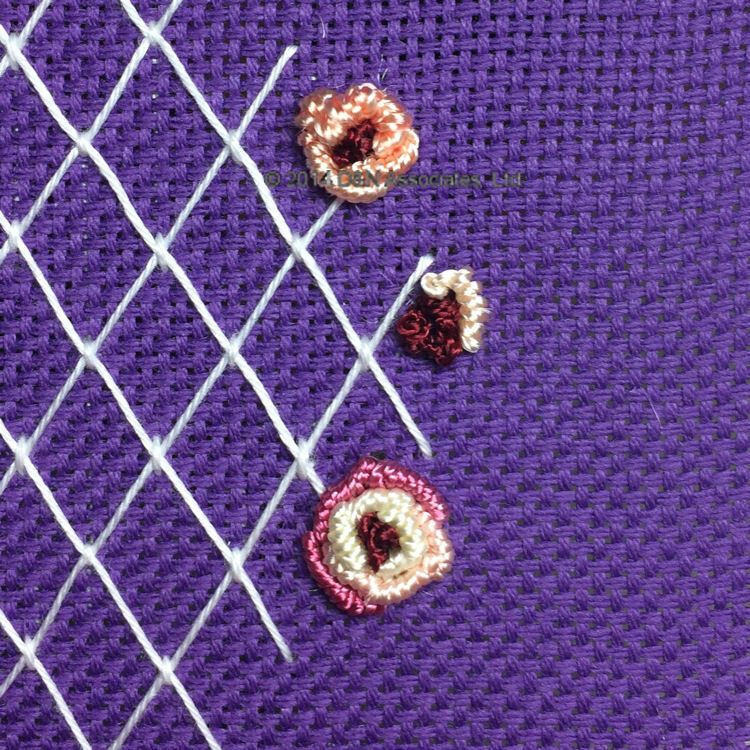 I wanted a different stitch for the rose centers and decided on two-wrapped French knots, six French knots within each rose center. I used Edmar Glory color 230 which is a medium rust for the centers. 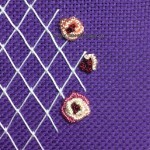 The instructions suggested to use two strands of white Kreinik Mori Silk for the bullion roses. I had used the white Kreinik Mori Silk within my work for the cyber class but I felt like Edmar rayon thread would produce more interesting looking bullion roses. So I used Edmar Lola weight thread for the bullion roses in two different colors. The lower bullion rose is worked in Edmar color 323 (pale yellow – salmon -rose). I used Edmar 104 color (med. to dark peach) for the top bullion rose. The other four roses (on the left) are also worked in Edmar 323 and 104. The lower bullion rose in this above photo was the first one that I did on this worked piece. I quickly decided I was making the bullions too tight and so for the remaining six bullion roses I stride for a looser, more cabbage looking bullion rose.